PROPERTY DESCRIPTION: Easy access and tranquil living are at your fingertips with this custom built home offering over 3700 square feet on 80+- acres! Just 1 mile from HWY 177, this property awaits your family and friends! 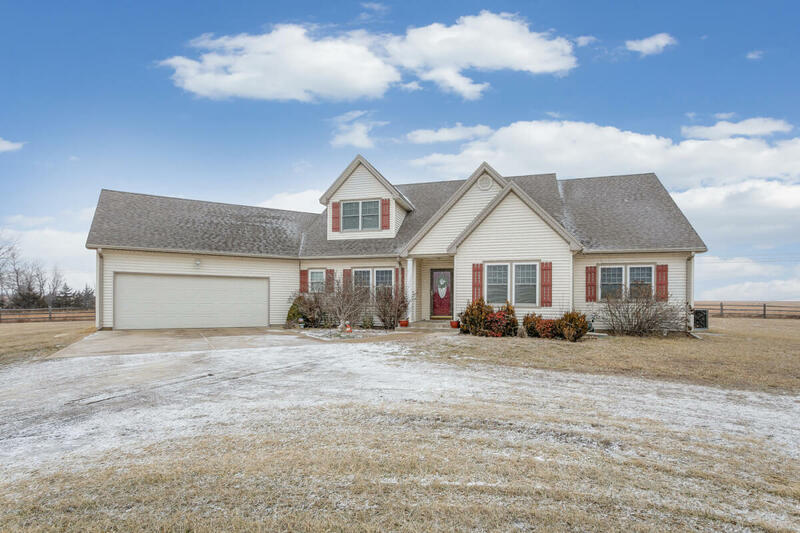 Step inside to find an efficient, open floor plan with large living room, kitchen, 2 possible formal dining areas, master bedroom suite with recently remodeled bathroom, 3 additional bedrooms, 1.5 additional bathrooms, and separate laundry room all on the main level. Upstairs was recently finished to offer incredible additional space with a large 5th bedroom, loft/living area, and full bathroom. The shop is 48′ x 32′, 2 story, with a half bath rough in. Balance of the property primarily consists of hay meadow, with a pond near the house. Enjoy morning coffee, or evening tea from the back porch and enjoy the view! LOCATION: From El Dorado, east on HWY 54 5 miles to HWY 177, north on HWY 177 9.5 miles to Ellis, south on Ellis to 75th, east to property.